On Saturday, the women’s track and field team hosted and placed first in the Snowflake Classic — aptly named for a sunny day with the mercury nearing 70 degrees. In the first of two home meets at Ellis Oval, the Jumbos saw only two first-place finishes in events, but several athletes scored points for the team, hitting personal records and nationally ranking times on the way. Ultimately, Tufts scored 148.5 points, 40 points ahead of second-place Rensselaer Polytechnic Institute (RPI). One of the biggest personal records of the day was senior co-captain Evelyn Drake’s 152’3” hammer throw — nearly six feet farther than her previous best. Currently that mark ranks No. 28 in the country. Other notable finishes included first-year Hannah Neilon’s personal record 2:17.47 in the 800-meter, which ranks No. 17 in the nation, and first-year Danielle Page’s first place 38:45.46 time in the 10k, where she claimed first place, in her collegiate debut in the event. The time is good for No. 24 in the nation. The Jumbos dominated in many other events, too, though most athletes only competed in one event, according to Morwick. Junior Julia Gake placed third in the 200-meter with a time of 26.91 and placed fourth in the 400-meter at 58.90. The finish in the 400 ranks nationally at No. 27. 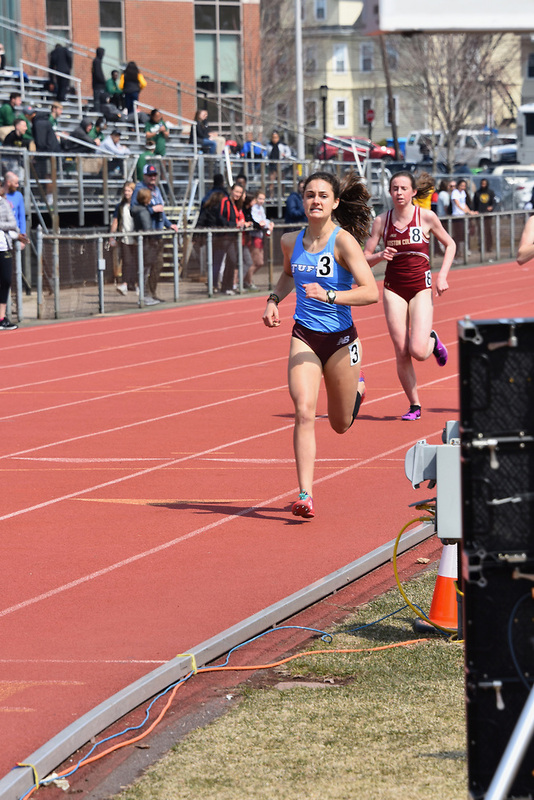 Behind Neilon in the 800-meter, the Jumbos had two other runners run top-50 national times: junior Rhemi Toth came in fifth at 2:17.92 (No. 25) and junior Lauren Diaz came in seventh at 2:20.28 (No. 50). In the distance events — which there are more of during the outdoor season — the Jumbos also fared well. First-year Anna Slager, in her collegiate track and field debut, ran a time of 4:51.17 in the 1,500-meter, good for fourth place, while senior Olivia Barnett was just over a second off that time in sixth place with a 4:52.86 time. Senior and co-captain Kelsey Tierney placed seventh in the 5k with a time of 18:34.18, and senior and co-captain Jennifer Jackson finished behind Page in second place in the 10k at 39:36.64, which ranks No. 24 nationally. Senior Kylene DeSmith hit a personal record in the preliminaries of the 100-meter hurdles, then went on to place sixth with a time of 16.25. Meanwhile, in the 400-meter hurdles, sophomore Hannah Norowitz placed fourth with a personal best 1:09.14. Transitioning from the indoor season, the relays continued to be a strength for the team. The 4×100-meter team consisting of sophomore Olivia Schwern, junior Alina Strileckis, junior Raquel Whiting and DeSmith came in fourth at 50.66 and the all-first-year 4×400 meter team of Tara Lowensohn, Luana Machado, Julia Worden and Neilon placed second with a No. 19 nationally ranked time of 4:03.06. Beyond Drake’s hammer throw, the Jumbos hit some impressive marks in the other field events, many of which happen only in the outdoor season. First-year Afroditi Georgiadi jumped a personal best 5’3” in the high jump, good for second place and No. 14 in the country. In the pole vault, senior Sydney Ladner took second at 9’8”, senior Sharon Kelmar took third at 9’ 2¼” and sophomore Rachel Kiehne took fifth place with a 8’8¼” leap. In the long jump, sophomore Scarlet Bliss’ personal record 16’10¾” earned her third, while first-year Kathryn Ezeoha was not far behind in fourth at 16’8½”. As the team transitions outside for the spring, one of the biggest factors to contend with is the weather. Even though Saturday was unseasonably warm, the wind was still a challenge. Morwick also explained her goals for the team as the season moves on. The Jumbos will look to continue to qualify this weekend, when they compete at MIT alongside Bates and RPI.